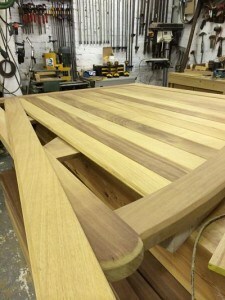 Set up by brothers, Gary and Craig Miller, Belfast Bespoke, is a Bespoke Joinery Manufacturer. We are a small,family run local business. Working from our fully equipped joinery workshop, offering bespoke and specialist joinery services to Belfast and the surrounding areas. Our reputation has been built on manufacturing high quality bespoke joinery items. Using both traditional and modern methods along with the best materials available. We also know that the best way to grow is to give fantastic customer service and satisfaction. Understanding that this goes hand in hand with quality hand made products. So we believe that the quality of our craftsmanship is demonstrated in satisfied customer’s recommending our services. This is principally how our business has grown to where it is today. The quality of our joinery products starts with the careful hand selection of every section of timber that comes into our workshop. Only the best quality timber and materials are chosen for our joinery and we do not believe in compromising cost with quality. As one of the only Joinery manufacturer in Belfast, we guard our reputation of quality seriously. We will never compromise our standards of quality or craftsmanship to achieve a lower cost product. Everything from initial contact through to planing, manufacture and final installation /delivery will be undertaken by us. We hand make everything ourselves. This ensures that your ideas are never compromised and your expectations fulfilled. We have an appreciation and understanding of good joinery principals and design along with attention to detail. This enables us to offer custom made joinery products, be they traditional or contemporary, that are second to none. We are very proud of our products and feel it shows through our work. Job satisfaction is very important to us and we go that extra mile in every aspect of our work. Our experience means we can offer our clients a professional and personal service. As one of our clients you will find that our service and attention to detail goes beyond all others. Our good reputation and our high quality is your assurance that you are investing in properly made and designed bespoke joinery .